“What Is Code?” by Paul Ford is our July 2015 Webtext of the Month. 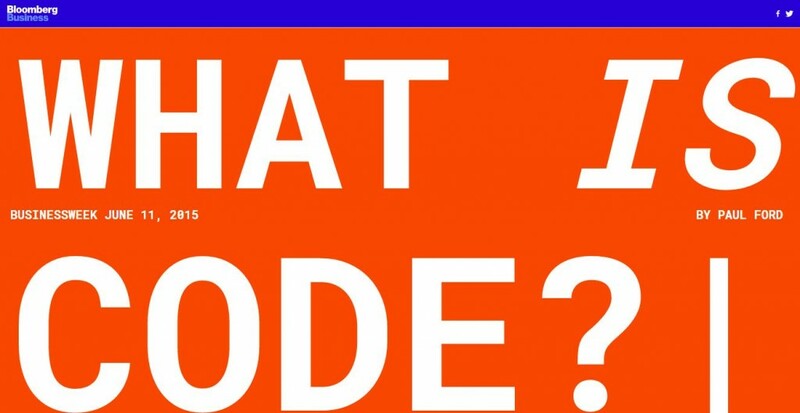 What follows is a list and selection of responses, reactions, and discussions pertaining to “What Is Code?” for students, teachers, and designers to think about digital journalism. Feel free to leave us a comment and share a link to a resource that adds to this conversation. The article is the longest single story the Bloomberg Businessweek magazine has published, 72 print pages of words and code, and 38,000 words and about 100 graphics online. 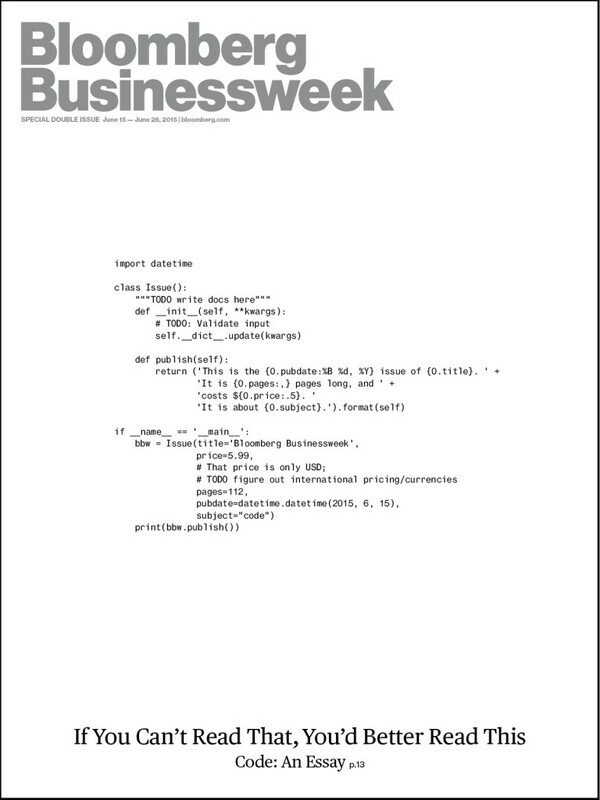 The cover of the Bloomberg Businessweek print issue (dated June 15 – 28, 2015, and on newsstands June 12) is written in the programming language Python 3 and instructs “If You Can’t Read This, You’d Better Read This – Code: An Essay.” Ford’s essay appears over 72 pages of the 112-page print issue, and is the longest story ever published in the magazine. Q: I read in one of your notes that this all really started as a short article and grew from there. Ford: Oh yeah, it was ridiculous. It was like a game of chicken. It all really started over a year ago, and I just avoided dealing with it for six months or so. Just total procrastination, hid from the problem, didn’t answer emails, and then he was like, “Maaaybe it’s time now.” And then he started to troll me on Twitter. Ford’s piece started out as a 2,000-, then 4,000-word piece. It grew much longer from there, demanding the efforts of a team of editors, graphic artists and web developers to make it what it is now: An interactive primer that not only teaches how computers process code, but commits code as part of its narrative. On newsstands, the deep dive has sold more copies than any other issue to date this year, a Bloomberg Businessweek spokeswoman told HuffPost. In the three weeks since the online version of the story went live, it has generated more traffic than any other article since the launch of Bloomberg’s business site, according to the spokeswoman. The pushback has been strongest from the software community, which has taken exception to the piece’s various omissions — one observer pointed out, for instance, that the piece barely mentions software security. As a publication that has both a print and an online component, Bloomberg Businessweek also avoided a common pitfall. Often, long magazine pieces are simply posted online in all their text-heavy glory, but in this case editors on the print side worked in tandem with the digital team for months in advance, holding joint meetings to discuss how the work would live online. I’m not sure this sounds like a recipe for clickbait in a world where celebrities, silliness and sleaze often dominate. Let’s write a story about computer code and how computers work. Let’s do it long form. And not just kind of long form. Seriously long form. Let’s do a piece that in effect decodes an entire civilization. Oh, and if it’s 38,000 words, no problem. I’m a long form guy. I once read a 22,000-word profile of Yahoo CEO Marissa Meyer on a phone. (My colleague Roger Yu is not the only person to suggest that this was a desperate cry for help.) Yet even I found the length of What Is Code? daunting. At the same time, I totally applaud the bold effort to tell the entire story. Apparently I’m not alone. And to answer your question: What did What Is Code? displace as the site’s all-time champion? It was the April 27 ditty, The Best and Worst Fonts to Use on Your Résumé. The piece is worth assigning in writing courses with technology themes or issues, cultural study courses, technical communication courses, philosophy (yes, philosophy) courses, where any goal of the course is to understand humanity’s relationship to machines. The idea that coders or programmers are the unacknowledged legislators of our world, a riff on Percy Bysshe Shelley’s concluding sentence in “A Defence of Poetry,” that Poets are the unacknowledged legislators of the world, is not new observation. Depending on your approach and what you want to emphasize, you might want to ask students to first read this short HP interview Ben Cosgrove had with Douglas Rushkoff about consumers increased need for media literacy. Ford’s piece goes a long way to giving students the kinds of context and understanding useful for understanding the kinds of web literacy Rushkoff advocates. A Sweetland Digital Rhetoric Collaborative fellow in 2013-14 and 2014-15, Brenta Blevins is an Assistant Professor of Writing Studies and Digital Studies at the University of Mary Washington. She completed her PhD in digital rhetoric and composition at The University of North Carolina at Greensboro where her dissertation examined the rhetoric and literacy of virtual, augmented, and mixed reality. She previously worked in the software development industry. Her current research interests include Virtual Reality, Augmented Reality, and Mixed Reality, digital literacy and digital pedagogy, and multiliteracy/multimodality.